No, this isn’t the Rowan Atkinson Britcom, it’s one of the best documentary ever made. 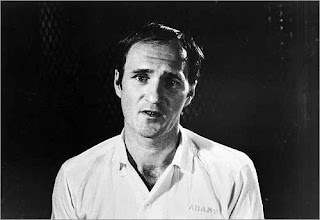 In 1976, Randall Adams, a wrong place at the wrong time drifter was arrested and imprisoned and put on death row for the murder of a police officer in Dallas, Texas. In 1987, while making a film on a judge with a notorious claim to fame of having sentenced the most people to death, Errol Morris discovered the case of Randall Adams. During his interview, he became convinced Adams was innocent. His Death Row documentary was abandoned and instead focused solely on Adams. Morris’ meticulously reinvestigated the case. The film interviews all the circus-like cast of characters and uncovers the comedy of errors that became the basis of the jury’s ridiculous verdict. Morris’ interviews are one of his signatures. He invented a device through which the interviewees he’s talking to can actually appear to look straight into the camera when questioning them. The subject actually break the fourth wall with the audience creating a unique interactive experience. Intercut with the interviews are a series of highly polished and creative reenactments. But unlike bad dialogue with second rate actors, Morris shoots these scenes artistically, obscuring actor’s faces, using slo-mo and extreme closeups to create a dreamlike sensation. His technique has been copped by virtually every other documentarian, but even today, when Morris crafts a recreation he does it better than anyone. Morris was one of the first filmmakers to use the brilliant composer Phillip Glass for his scores. His music for “Thin Blue Line” is magnificent and atmospheric and utterly creepy. It feels like a wave taking us further away into the world of the film, in this case, the seedy world of small town America. But the stars of the film are the interviewees. Morris’s cast of oddball characters include, the pathetic Perry Mason-loving crime fighter couple who witnessed the murder to Adams’ inept lawyer and judge to the real murderer, David Harris, the real killer, whose awk shucks attitude toward the murder sends shivers down your spine. The facts and the evidence adds up to a shamefully botched police investigation and trial which resulted in an innocent man’s imprisonment for over 10 years. Watching the legal system fail and topple like a house of cards is haunting and disturbing. The scariest moment of the film is the final taped phone conversation between Harris and Morris, for which, I think I held my breath during the entire 5 minute call. This is a must-see. Enjoy.